A Nagueño in the Blogosphere: The world's longest? LAST Friday, I overheard somebody say this year's military parade should already be the longest of its kind in the world. 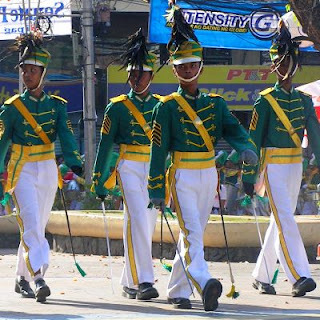 According to Gil de la Torre of the Sanggunian secretariat, the parade involved more than 430 high school and college men and women contingents from all over Bikolandia -- from the prominent ones like the marching units of the Naga City-based schools like UNC and the Ateneo, to the most distant public high schools who braved the heat and the long wait. Why don't we limit them? I asked Councilor Nathan Sergio early today. That would be difficult, he said. You're talking about extraordinary commitment -- every decision made to join the parade is not a spur-of-the-moment kind. It is made months before -- kids, parents, teachers, trainors, school administrators and other bit players have to purchase their uniforms, train hard for the big day (and these would take months), wake up early, prepare logistical support, arrange transport et cetera just to be able to get their moment before the reviewing stand. And you will deny a bid and everything that goes with it? That would be heartless. According to reports, the parade started past 7 am and finished at around 4:30 pm -- that's nine straight hours! Rizza Mostar of ABS-CBN was announcing the winners just in time for TV Patrol-Bikol, and it was already dusk. The longest parade in the world is the "Marksmen's Parade" and takes place in Hanover every year during the Schützenfest. The parade is 12 kilometres long with more than 12,000 participants from all over the world, among them more than 100 bands and around 70 floats and carriages. Do the math, and I think the recent military parade has a fighting chance: At about 100 persons per contingent (three platoons of 21 each, plus officers, plus drum and bugle corps, plus the majorette squad), we're talking of an upper limit of 43,000. The Hanover event, on the other hand, only had 12,000. I'm not sure though about the length. Would anybody have an idea just how long would the 430 participating teams in the recent parade stretch? with a 3-column platoon and assuming a meter distance in every row... your 43,000 participant estimate results to 14,333 meters/14.33km. will someone please lobby this to the guiness?!! Hey, that's trully amazing! Although I was not able to go home for the fiesta and personally witness the parade, I think the queue of participants increases every year. I am only concerned about the potential health hazards on the participants being exposed to the scorching heat of the sun or raging rain for many hours. I don't think people would mind watching through a very long parade like that just as long as there are actually interesting things to see. Not just endless hordes of people walking. Long parades should be broken up here and there with bands, floats, street performers, etc. to keep the attention of on-lookers. It's just irresponsible and rude to "ask" people to watch one that's both very long and "empty". There was a time when the civic (where the floats, street performers etc come in) and military parades were a single event. It was so when I was still in collge. But it went too long so it was split into two. This year, the civic parade lasted around four hours. If you add that up, that would amount to a 12-hour nonstop event that would easily last up until early evening. willy, do you have pictures of adnu's cadets? i'm planning of writing something about the parade, maybe some time after admu bows out of the UAAP (which might be sooner rather than later). jedd, i think the parade has a rotating audience. that is, people would crowd in only to watch their school. perhaps also, the men would be content in checking out the majorettes all day long. where can i see the list of the participants and the winners as well of the military parade? Quite an interesting post. It was quite new to me.